Jace Powell grew up in Denton, TX where he attended Denton High School. After graduating in 2005, Jace attended Austin College in Sherman, TX where he played football for four years, making team captain his senior year. Jace graduated from Austin College in 2009 with a double major in Business Administration and Communication Studies. 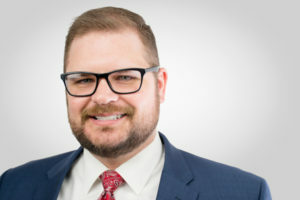 After Austin College, Jace went to Oklahoma City where he attended Oklahoma City University School of Law and Oklahoma City University Meinder’s School of Business. While in law school, Jace participated in numerous organizations including: SPELA, Oil & Gas, and Pi Alpha Delta legal fraternity. While at OCU Law, Jace achieved a CALI Excellence For The Future Award in National Security Law and obtained a certificate for his focus in legal research and writing. Jace graduated from Oklahoma City University with his JD/MBA in 2012. After passing the Oklahoma Bar Exam in 2012, Jace took a position at the Tulsa County District Attorney’s office where over 80% of his cases resulted in finding of guilt. In 2014, Jace went into private practice where he joined the ranks of Pierce, Hendrickson, Baysinger & Green, a member of the US Law Network, and one of the oldest and most respected insurance defense and corporate law firms in Oklahoma. Jace was admitted to the Texas Bar in 2018 and joined the Silvera Firm where he continues the practice of administrative and civil litigation. Jace is a member of The State Bar of Texas, Oklahoma Association of Defense Counsel, Oklahoma Bar Association, and American Bar Association. He is licensed to practice before all Texas state courts and all Oklahoma state courts.